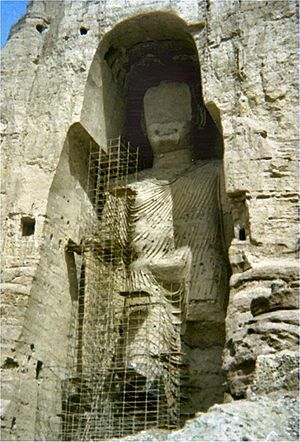 The Buddha’s of Bamiyan had stood in alcoves within the cliff walls of the Bamiyan valley in Afghanistan since the 6th century. The two statues, measuring 55 and 37 meters, were the most famous landmarks of the region and were listed by UNESCO as a World Heritage Site. That was, however, until 2001 when the Taliban regime decided that the statues conflicted with Islamic laws of idolatry. They were summarily blown up using artillery and dynamite. Such destruction was common throughout the country at this period with artefacts and landmarks of unparalleled historical significance facing the wrath of the regime. The problem was further exacerbated by the revolving periods of conflict within the country, which led many to believe that this history would be lost. Thanks, however, to the work of concerned parties within the country, as well as the funding and assistance of organisation throughout the world, Afghanistan is now embracing its cultural heritage again. The Kabul Museum, which was once considered one of the finest in Central Asia and boasted over 100,000 items dating back several millennia, was re-inaugurated in 2004 following an investment of US$350,000 from the International Community. The artifacts on display now only managed to survive thanks to the work of staff who took steps to hide the artifacts in vaults throughout the city. The artifacts now on display only survived thanks to the help of workers who hid the works in vaults throughout the city. In 1988, Afghanistan was ten years into a violent civil war and as the security situation in the capital worsened, government and National Museum officials worried that the museum would be destroyed. Plans were made to transfer many of the objects to secret hiding places. Priceless historical objects were secured in the Ministry of Information and the Central Bank treasury vault at the presidential palace. This included the “Bactrian hoard,” a collection of some 20,000 gold, silver, and ivory objects from burial plots at Tillya Tepe in northern Afghanistan. Despite constant conflict and political upheaval in Kabul the objects remained safe until 2001 when the Taliban destroyed many items hidden in the Ministry of Information. Thankfully many of the artifacts survived and in 2003 a report from the Central Bank in Kabul revealed that the museum trunks deposited at the palace vault in 1989 were intact. A year later this led to an announcement that the Bactrian hoard and other hidden treasures of Afghanistan were found, and an international effort was mounted to preserve these collections. A similarly optimistic story can be found by the remains of the Buddhas of Bamiyan. The remnants of the statues were included in the 2008 World Monuments Watch List of the 100 Most Endangered Sites by the World Monuments Fund, and in 2006 it was reported that Afghan officials were deciding the timetable for the re-construction of the statues. Further good news came with the discovery of another statue. The new 19m statue dating back to the 3rd century has given archeologists further hopes that a massive 300m long statue may still be waiting to be discovered in the area. And as if this were not enough in 2008 an international team of conservators and archaeologists found the world’s oldest-known oil paintings in a maze of caves within the area. The Los Angeles-based Getty Conservation Institute analyzed 53 samples from the murals that date back to about 650 A.D., concluding that they had oil in the paint. News of such hopeful stories as those found in the Bamiyan Valley and Kabul Museum show that Afghanistan has the potentially to be a site of huge historical interest to the world. This must be preserved and cultivated. Not only will these continuing discoveries help to further our knowledge of such an important geographical heritage, but they could also contribute to a potentially lucrative tourism industry in years to come once occupation of the country has finished. It is not entirely unforeseeable. After all, Iraq is already publicly looking at the potential for tourism in the country post-occupation. In fact China has already trained more than 500 Afghan government officials in a broad range of areas including tourism. These finds are just further evidence that despite its difficult history Afghanistan has not only a past but also a future. But it must embrace this with open hands. Only then will the country begin to profit from what it thought had been lost.